Custom Leathercraft Work Gear is a company which is founded in the year 1981. Custom Leathercraft or, in other words, CLC is a leading manufacturer of innovative products and tool storage solutions for the hardware, construction, automotive and farm industries. Custom Leathercraft’s mission is to fully develop the work gear and adapt it for workers safety, productivity, comfort and style. CLC runs their business for more than 30 years and, as they think, it is thanks to innovative designs, high quality products and great customer service. These Custom Leathercraft knee pads are meant for knee protection during works which are connected with kneeling and crawling on different surfaces to avoid various knee injuries, for example, bruises, abrasions or scratches which are quite common in works like carpeting, concreting, tiling, flooring, gardening and construction. As manufacturer has determined, these knee pads are intended for knee protection during work on rugged surfaces such as dirt, rocks or bricks to prevent knee damages. 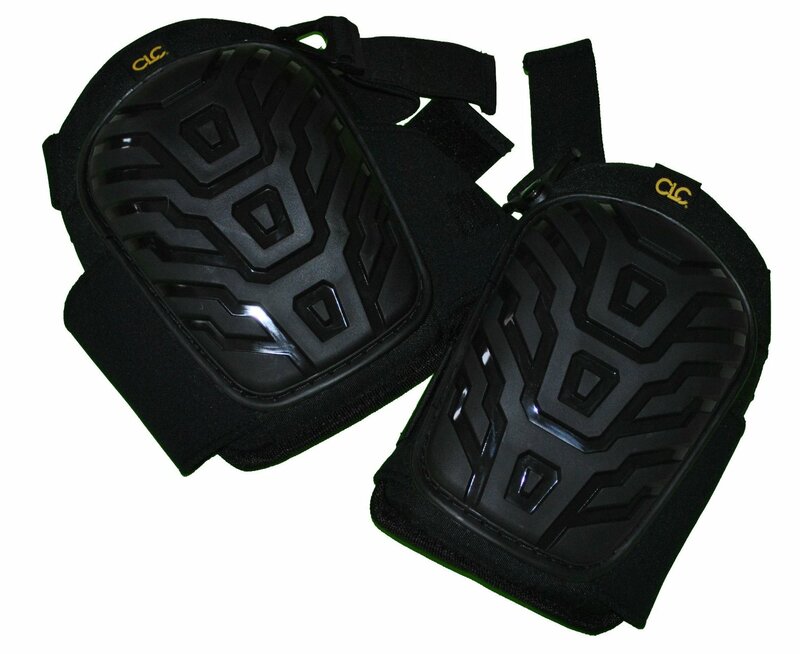 These CLC knee pads are made mainly of super tough 600D polyester fabric which ensures durability and thus longevity. These pads are equipped with extra large caps, thereby providing bigger coverage and thus knee protection. Each of them has two straps – breathable neoprene lower straps with Velcro closures below the knee for comfort and adjustable straps with slide buckles above the knee for fit and stability. Another useful feature of these knee pads is grab tab which eases positioning of knee pad. This product has 0.5 inch thick, high density padding which is made of EVA foam and tricot lining, ensuring comfort all day long. It should be mentioned, that this Custom Leathercraft has one year warranty which is sign of quality. These knee pads come only in black color. They have large caps with geometrical relief which gives them an interesting and stylish look. These CLC knee pads have two straps – elastic straps with Velcro closures below the knee and adjustable straps with slide buckles above the knee. They also have thick padding which contains closed-cell foam and tricot. These pads have yellow CLC logo on top. These Custom Leathercraft knee pads are available only in one size, but, as they have elastic and adjustable straps with Velcro closures and slide buckles, they are adjustable to any size. These Custom Leathercraft 345 Professional Knee Pads are intended for knee protection during works which are connected with kneeling and crawling, for example, carpeting, concreting, tiling, flooring, gardening and construction to prevent knee damages. These pads are manufactured only in black color and are made of polyester, neoprene, tricot and ethylene-vinyl acetate. This products dimensions are 6.8” x 9.8” x 4.5” and its weight is 1.4 pounds. As these knee pads have elastic and adjustable straps, they are suitable both for adults and youngsters. This CLC product has many features such as 600D polyester fabric, extra large caps, two-strap fastening with slide buckles and Velcro closures, grab tabs and, what is really important, one year warranty. They are machine washable and usually they are sold in pairs.